Deep Purple will reissue a collection of eight classic albums from the 1970s on purple vinyl on September 7. The fall release will include studio albums “Machine Head” (1972), “Who Do We Think We Are?” (1973), “Burn” (1974), “Stormbringer” (1974), and “Come Taste The Band” (1975), as well as historic live packages “Made In Japan” (1972), “Made In Europe” (1976), and “Last Concert In Japan” (1977). As for the studio albums, “Machine Head” was a cornerstone rock album featuring the timeless “Smoke On The Water” and “Highway Star”; “Who Do We Think We Are” - which included the hit “Woman From Tokyo” - captured the last performances by Purple’s Mk II line-up until 1984; “Burn” marked the arrival of vocalist David Coverdale and bassist/vocalist Glenn Hughes, with the title track and “Might Just Take Your Life” among its highlights; “Stormbringer” was guitarist Ritchie Blackmore’s last Purple album until the 1984 reunion; and, “Come Taste The Band” showcased the guitar work of Tommy Bolin. The live album reissues include “Made In Japan”, recorded in Osaka and Tokyo; “Made In Europe”, taped in Paris, Graz and Saarbrücken, which was the last release by the Coverdale-fronted line-up; and, “Last Concert In Japan” captured the final performance by the Mk IV version of the group, in Tokyo. 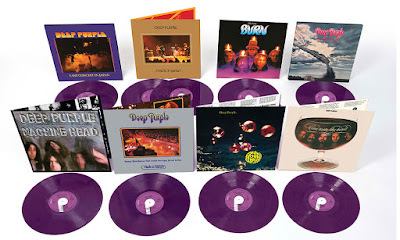 All albums in the 2018 vinyl reissue series have been cut from new digital transfers of the original master tapes at Abbey Road Studios, cut to heavyweight 180-gram purple vinyl; artwork has been faithfully replicated to match the original pressings, while all come with download codes, as well. “These albums were recorded in the ‘analogue age’ before digital CDs,” says drummer Ian Paice. “We went from recording tape to master cutting room to pressing plant – all of these mechanical processes. Currently on the road across Europe, Deep Purple will launch a series of North American dates with guests Judas Priest in Cincinnati, OH on August 21.